Get Ready, Here Comes The Snow! Hey guys, I’m just looking over the most recent data and all I can say is wow. As of right now, snow lovers, REJOICE! We are looking at a possible significant winter storm on our heels. This one has been on the radar for a while, the models have shown a southern system for a few days. We are now in the “sweet spot” when it comes to model watching. A lot of times. we will see storms pop up 4-5 days out that end up trending too far north or completely dissipating. This one is less than 24 hours out. I’m short on time, so lets get right to it. The latest run of the NAM shows a storm passing to the south and pulling down TONS of cold air. 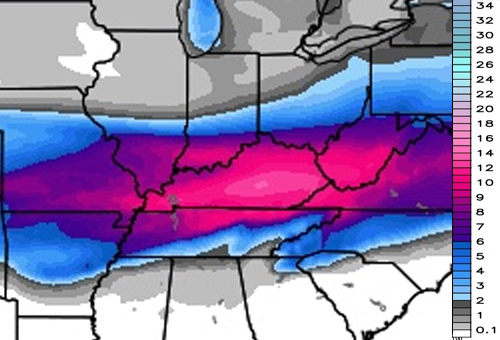 Most of EKY seems to get in on a lot of snow per this run, check it out. These maps from mesoscale models are not 100% accurate, even when we are this close to the actual event. 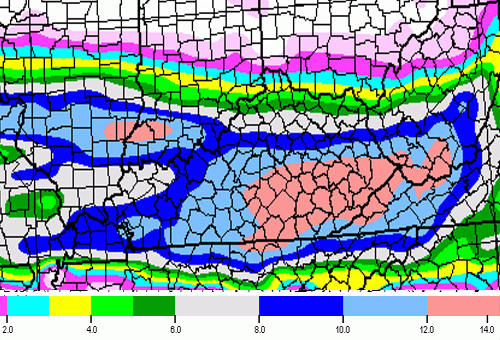 However, I think this is proof enough to say that there will be some sort of significant snowfall event in Kentucky. The LP passes to the south and cuts NE once it passes the first quarter section of inflow. These type of systems are notorious for dropping lots of snow in our area. If this model run is correct, the map above could be a close representation to an actual forecast map. The EURO is also on board with this storm. In the latest run, most of Kentucky gets slammed. I should have a complete forecast map out within the next 12 hours, stay tuned! This one is worth watching. I was just wondering when is the snow suppose to start, my husband works in Fairmont WV and we live in Phelps, Ky. He was gonna start heading to Fairmont at 6 or 7 in the morning but we were just wondering if maybe he would make it there before the snow starts getting bad or would it be better if he just drove up tonight? What’s the data showing? I see the color ranges but I don’t know what they are indicating. Is the top map showing 12″+ of snow for EKY?